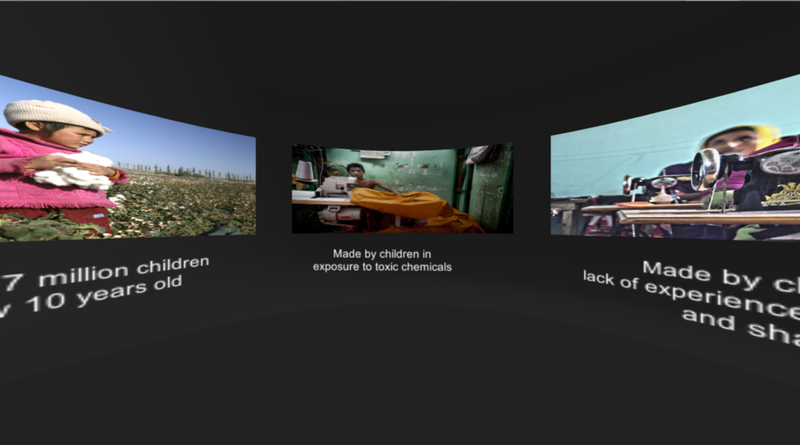 "Made By" is a documentary that surfaces the issue of child labor behind high fashion. This was a project for a hackathon held by Samsung Accelerator. The theme was "travel" so our team decided to show the travel of a shirt while tracing back its origin from a cotton field in Uzbekistan to factories in Bangladesh. Child labour is forbidden by law in most countries but continues to be rife in some of the poorest parts of the world. The ILO estimates that 170 million are engaged in child labour, with many making textiles and garments to satisfy the demand of consumers in Europe, the US, and beyond. How could we use VR to let voices heard that otherwise get ignored? When we buy a shirt, we rarely think about who made it or how it came the department store that we bought it at. Through virtually experiencing the journey of a shirt, we hoped to reveal a different side of fashion behind all the glamour. Traveling back to retail store in U.S.
Tag changed to "Made by children"